We are Condor Marketing with offices in Gulfport MS. and St. Croix US Virgin Islands, well until hurricane Maria gave us a sabbatical in Southern California for a month. We have been doing online and digital marketing since 2009, with SEO, Webdesign, Video Marketing, Content Marketing, and Reputation Marketing. What Makes You Different From Other Reputation Companies? Glad you asked. Since we are first and foremost a marketing company our goals are always to market, market, market, and with your reputation it is the same we not only provide the basics of review collection software but then we implement and market those reviews for the world to see, not just on your website but through social sites, and video distribution sites. Proven to get your reviews found on the world wide web and in a professional, stylish way. 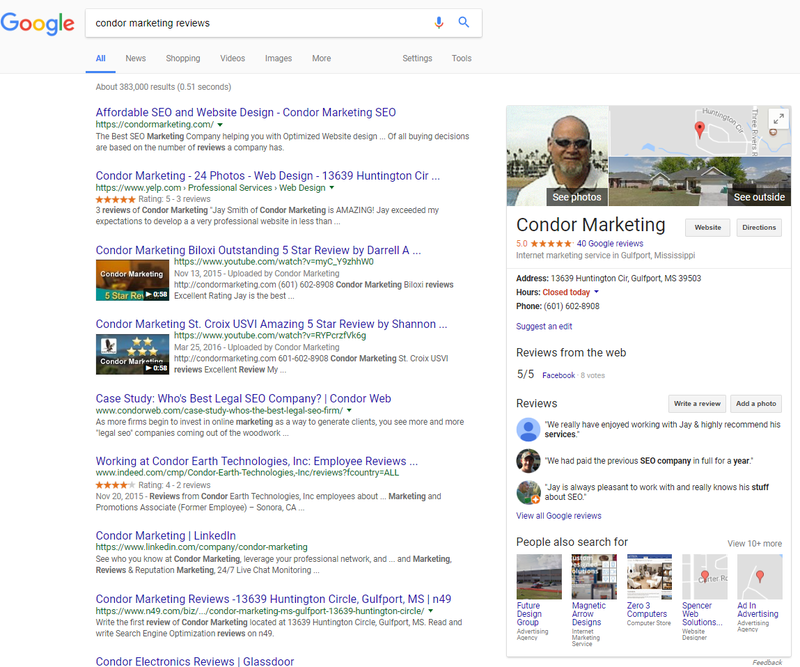 Get More Reviews was designed to work with any business whether you service accounts at their homes or business, if you are a brick and mortar shop or franchise, or if your are like us at Condor Marketing and help people over the internet. Our sign in/out/off form can be used in the field, in the store, office, or practice, and even sent online as a sign off for work completed. Once that happens the magic starts and our automatic system takes over and you see the reviews come in. All you need is a way for people to fill out the form where you are at. A SMARTPHONE WORKS GREAT! this is the easiest platform on the market. You never ask for a review and get them in droves. Short answer is no! We have never done business on a contractual basis for the 8 years we have been around for any of our services and we will not start now. You can cancel at anytime. We go month to month. How Much Time Do I Have To Spend Setting Up An Account? The good news is WE DO ALL THE SET UP FOR YOU! Your account representative will set a time to ask a few question needed for the set up this is accomplished in under 10 minutes unless you have additional questions. Normally we will have an account set up within 2-5 business days of your initial request and consultation. Once we have your account set up you will get an email with your login details. We will send you a request to connect your social accounts this process takes all of 10-15 minutes and should be done prior to us going live. How Do You Set Up My Social Accounts? Do I Need To Give You Access? This part of the process you do. We will send you an email asking you to connect your social accounts to our API’s Watch below. Does Google, Yahoo and Bing Index My Reviews? Short answer Yes! Google provides the most love because they own YouTube and will index not only your reviews from the schema markup but the Review Videos as well. Bing and Yahoo will show some love initially and then back off because that is the nature of the SEO beast, but under the video tabs of Bing and Yahoo you can always find a review for your company as long as you have the +Social +Video package. Do You Post Reviews To Other Review Sites Online? Short Answer No. It may look like that since if you look at the home page at the real time streaming reviews demonstration at the bottom of the page, the same review shows up in Google, Yelp and FaceBook multiple times. But in reality our system has multiple facets of auto-responders and goes a step further after the initial review has been posted by sending out a second email sequence showing the reviewer his original review and asking them to copy and paste it into another review site. Of course we also make it easy by giving them three links to choose from. Simply Brilliant! So Multiple reviews and social signals are created by one Raving Fan! Syndicating your reviews is part of Marketing your reviews, we do this by posting your Raving Reviews to social media and through video marketing. FaceBook personal page, FaceBook Fan Pages, Twitter, Google+, Linkedin, Pinterest, Foursquare, Flickr, Instagram, Youtube, Dailymotion, and Tumblr. We are constantly working to add new companies that will work with us and grant us permissions to build an api for their platform. Can I Get A Free Trial Without The 30 Day CC Option? No unfortunately not, the amount of volume we do is high and since we do not charge a set up fee and we know how good the system is and works, it is easier for us to lose a few lookers that may not take advantage of everything we set up for them than to go back and do billing and payment schedules a month later for everyone that orders. This way if someone does want to cancel we can handle those request much faster. How Does the Text Messaging Work? Our proprietary system and automated text marketing sequence goes into effect once someone signs in or out on the sign in form or if you put the information in. Within minutes or hours depending on what you prefer during your setup consultation from signing in/out/or off your client, customer or patient will receive a text message asking if they would mind giving you feedback on their visit. If they do that is it if they ignore it we normally schedule another request for 24 hours later and then again 48 hours after the second request. This method along with the email sequences that act in the same way have seen 40%+ on the initial text respond positively, another 23% respond on the second and 17% on average on the third request. Do I Need A Twilio Account For The Text Options? No you do not need a twilio account for your dashboard to work properly and to have the ability to send text request to your clients, we offer this option so you are not limited by the amount of texts that can be sent each month. The cost is so minimal we make it easy for you to get every advantage. How Do I Set Up A Twilio Account?